Moon Venom from DuWop has the same formula as the original Lip Venom, but is infused with stunning opalescent shimmer. Once applied, Moon Venom reflects the light, giving lips extra sheen for the fullest, flashiest pout. From the makers of the legendary Lip Venom - Duwop -comes a futuristic plumper bursting with celestial shimmer - introducing Moon Venom. Moon Venom has the same formula as the original Lip Venom, but is infused with stunning opalescent shimmer. Once applied, Moon Venom reflects the light, giving lips extra sheen for the fullest, flashiest pout. The secret behind Duwop Moon Venom is a blend of essential oils, which include cinnamon, wintergreen, and ginger, that cause the blood to rush to the surface of the lips, flushing and swelling them slightly. 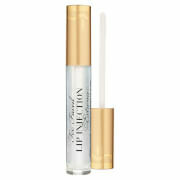 The gloss also includes jojoba and avocado oils that moisturize and give the lips intense shine.